Hydrocephalus is a disorder of cerebrospinal fluid disequilibrium of formation, flow and absorption, resulting into an increase in the volume of fluid within the cranial cavity. Hydrocephalus arises from an increased production of cerebrospinal fluid, reduced absorption, or obstruction of the flow. Treatment is mainly surgical by placement of shunts to divert the CSF; however, medical therapies are instituted to delay the need for surgery. The most common cause of death in hydrocephalus is tonsillar herniation and resulting respiratory arrest. Are you more of a visual learner? Check out our online video lectures and start your pediatric neurology course now for free! Hydrocephalus is a Greek word meaning water in the head which was the name given to the condition. It is a disorder of CSF disequilibrium in the process of formation, flow, or absorption resulting into accumulation of large volume of CSF within the cranial cavity. The increase in volume leads to brain damage that manifests as developmental, physical, and intellectual impairment. The disease has a bimodal distribution with a peak in infancy that is due to congenital malformations and a second peak in adulthood mainly due to the increase in normal pressure hydrocephalus. Worldwide, it is the most common cause of brain surgery in children. In the United States, there are 1,000,000 people living with hydrocephalus and one or two children in every 1,000 live births have hydrocephalus. Hydrocephalus has no sexual predilection. It is present at birth and results from complex interaction of genetic mutations and environmental influence on the infant. It occurs after birth and mainly results from acquired states such as trauma, tumors, or cysts within the brain. 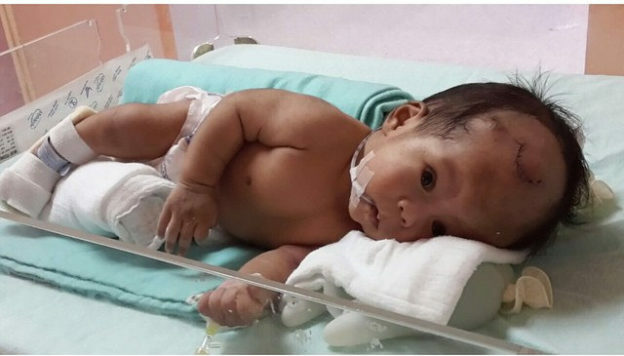 This is a type of hydrocephalus where there is uniform dilatation of the ventricular system and no evidence of an obstruction in the flow of cerebrospinal fluid. Segmental dilatation of a portion of the brain ventricular system proximal to an existing obstruction to the pathway of cerebrospinal fluid flow. A condition in which the enlargement of ventricles is not associated with increase in intracranial pressure. Dandy wanker: Cystic expansion of the fourth ventricle. Arnold Chiari: Protrusion of the structures of the posterior fossa through the foramen magnum. CSF is produced within the cerebral ventricular system, mainly by the choroid plexus. Each of the four ventricles contains choroid plexus tissue which is made up of villous folds lined by epithelium and a central core of highly vascularized connective tissue. Here, active secretion and diffusion produce CSF. From the two lateral ventricles, fluid drains through the foramen of Monro on each side into a single midline third ventricle. The third ventricle is connected by the aqueduct of Sylvius to a midline fourth ventricle that has three exit openings, paired lateral foramina of Luschka, and a midline foramen of Magendie. These openings lead to a system of interconnecting and focally enlarged areas of subarachnoid spaces referred to as cisterns which allow for free flow of CSF. 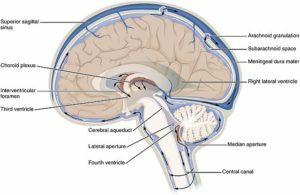 Fluid in the basal cisterns, tentorium, and subarachnoid space flows over the cerebral convexities to the sagittal sinus, from where absorption into the systemic circulation takes place. Most CSF absorption takes place across the arachnoid villi into the venous channels of the sagittal sinus, but fluid is also absorbed across the ependymal lining of the ventricular system and from the spinal subarachnoid space. In the normal adult, the total volume of CSF is approximately 150 mL, 25% is within the ventricular system, and the CSF is formed at the rate of 20 mL/h. The process of CSF formation continues when the intracranial pressure rises, unless extremely high levels are reached; thus, there must be some absorption of fluid to accommodate the volume of CSF being formed each day or more room for expansion must be available. Causes of hydrocephalus take any of the four pathogenic pathways to result in accumulation of cerebrospinal fluid within the brain. Increase in cerebrospinal fluid production that may be caused by tumors of the ventricles such as choroid plexus papilloma and carcinomas. Reduction in the rate of absorption as seen with subarachnoid hemorrhage and meningitis that make it difficult for the brain to absorb CSF. Obstruction of the flow of cerebrospinal fluid; thus, the fluid does not reach the sites where it is absorbed. Dilatation of the ventricles proximal to the obstruction is the manifestation of this pathway. Some of the common causes of obstruction include colloid cyst of the third ventricle that obstructs at the foramen of monro and tectal plate glioma that obstructs and the cerebral aqueduct. Idiopathic enlargement of the ventricles giving an impression of excessive fluid within the brain. Increase in the volume of fluid within the cranial cavity causes dilatation of the ventricles. The frontal and occipital horns of the lateral ventricles are involved first. The increase in intracranial pressure pushes the gyri against the bony surfaces causing them to flatten. The sulci are thus compressed and obliterated. Patients with hydrocephalus will, thus, present with features of raised intracranial pressure and impending brain damage. Clinical presentation of the condition depends on the age of the patient and the causative pathway of the disease. The clinical features are mainly suggestive of increased intracranial pressure with certain behavioral and neurological changes. Serial measurements of head circumference across the percentiles gives the diagnosis if the measure exceeds the 98th percentile. Complete blood count (CBC) and renal function tests: May be done in preparation for theater and as a baseline before the initiation of medical management to detect any complications. Antenatal ultrasounds: Makes the diagnosis of neural tube defects that are mostly associated with hydrocephalus. Ultrasound of the head: Preferred imaging in neonates as it is free of complications such as radiation exposure and hypothermia. Identifies dilated ventricles. CT scan of the head: Excellent method of imaging the brain in case of suspected tumors. Delineates the structural pathology and its position. It is the preferred imaging in older children and adults. MRI scan of the head: Has similar use as the CT, but it is more superior in brain tissue assessment; thus, it is best for analyzing congenital malformations. Lumber puncture and CSF analysis: The opening pressures should also be within normal ranges (5–18 cmH2O). Lumbar puncture is contraindicated in patients with a risk of brain herniation such as those with space occupying lesions and obstructive type of hydrocephalus. Include subarachnoid and acute subdural hematoma, all which present with an acute onset and an accompanying history of trauma. They are the underlying causes of hydrocephalus and differentiation on imaging characteristics, location, and likely cells of origin. They include Glioblastoma multiforme oligodendroglioma and meningiomas. They are usually associated with other signs and symptoms, such as seizures that are rare in hydrocephalus. It is predominantly surgical with no curative interventions available to date. Some medical approaches to delay the need for surgical intervention have been instituted. Shunting: It involves the surgical placement of a one-way valve drainage system from the proximal ventricle to the distal drainage system through the subcutaneous tissue. Ventriculoperitoneal shunting involves diversion of the excess CSF flow into the peritoneal cavity. Ventriculopleural shunting involves diversion of the excess CSF into the large vessels of the heart that eventually drain into the right atrium. Endoscopic third ventriculostomies: This involves endoscopic access of the obstructed segment and establishment of an alternative route of flow via puncturing of the ventricle. Medical therapy is important when surgery is not the best option at the time, such as in neonates and young children. In addition to that, the methods are also less effective in chronic hydrocephalus. Acetazolamide with furosemide: Diuretics that work by eliminating excess body fluid and reducing the rate of CSF secretion. Isosorbide: increases the rate of cerebrospinal fluid absorption. Serial lumbar punctures: They are important in the alleviation of the symptoms of increased intracranial pressure, such as severe headaches and vomiting. Visual problems: Arise from compression of nerves involved in vision due to stretching from the dilated ventricles. Cognitive dysfunction: Motor nerve fibers are not spared from stretching and compression against the enlarging ventricles and lesions seen in hydrocephalus. Incontinence: It’s usually associated with normal pressure hydrocephalus. Shunt malfunction: It is estimated that up to 40% of the inserted shunts fail within the first year. The rate reduces drastically to around 5% after one year. Infection: Infections may arise from the skin during the procedure or the overgrowth of normal gut flora. Underdrainage: Manifests by the persistence of hydrocephalus signs and complications even after placement of the shunt. Subdural hematoma: Arises from traumatic injury to the vascular system during stent insertion. Abdominal complications: Excessive fluid flow into the abdomen results into ascites and increase in intra-abdominal pressure which is responsible for hernia development. Electrolyte imbalance and metabolic alkalosis: The induced diuresis results into loss of fluid and electrolytes. The main cause of mortality in these patients is tonsillar herniation that compresses the brainstem, leading to respiratory compromise and death. Hydrocephalus, once diagnosed, runs a chronic course that is shunt dependent in most cases. Morbidity and main cause of hospital re-admission is shunt-related complications that, once sorted out, allows the patient to live a near normal life. Bailey, H., Love, R. J., Mann, C. V., & Russell, R. C. (1992). Bailey and Love’s short practice of surgery. London: Chapman and Hall medical.